Winter is upon us and time is of the essence. 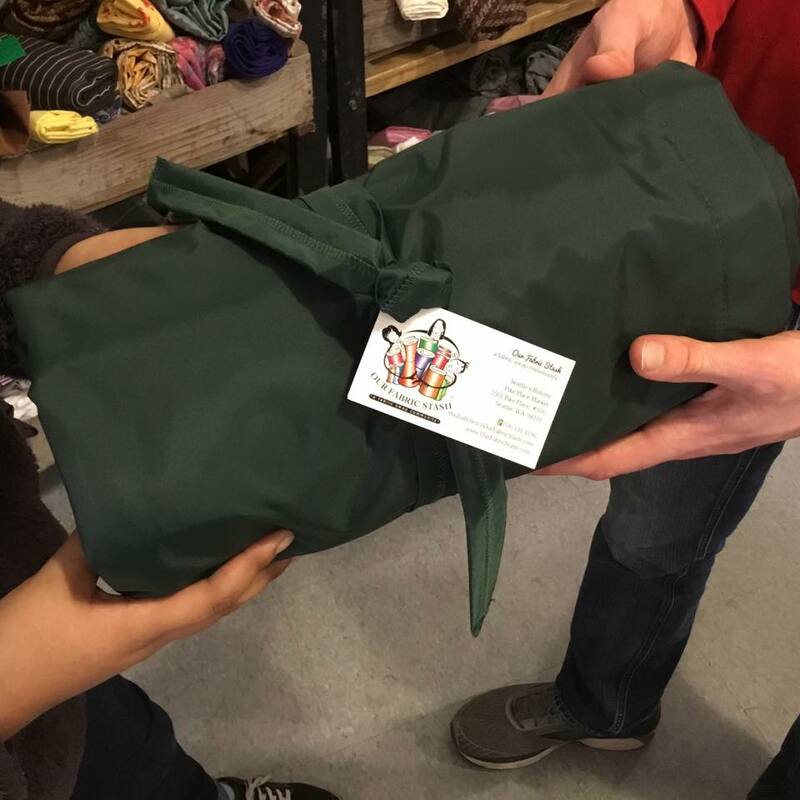 Order a Homeless Sleep Care Cushion today! Note: Use the presser foot as a guide for sewing Step 2 and Step 3. Back stitch at the beginning and end of the seam. 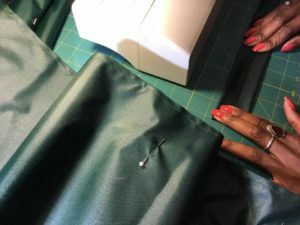 After completing each seam, bring the needle to the top position and remove from the machine (pulling toward the back left of the machine). Clip the threads close to the stitching. Step 2: Pin across the top of the bag with the ties pinned in at 7 or 8 inches in from top of the sewing side. 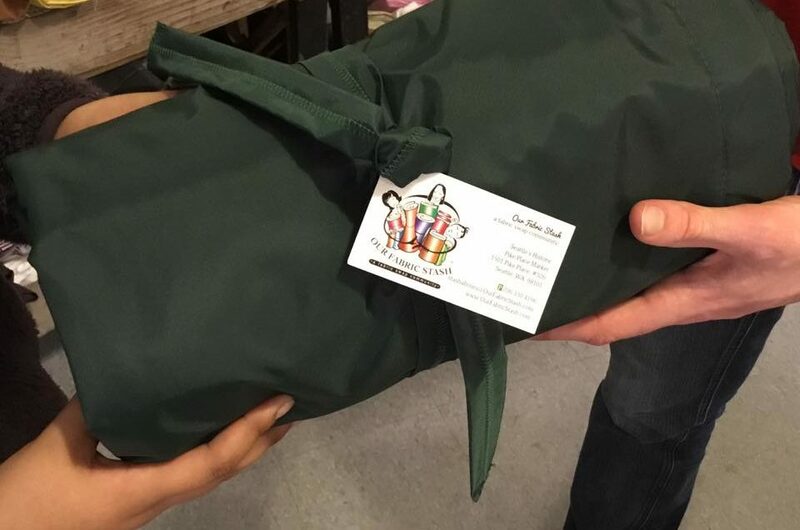 The ties should be hidden in the body of the bag and enclosed in the seam. Sew the seam. Step 3: Pin the open side from the stitch line down to within 4 inches of the bottom, placing two pins there as a reminder to stop and back stitch. Sew the seam. Step 1: Pin the wool layer of fabric onto the top seam of the bag from right to left about every four inches. Be sure to flush the selvage edge of the wool fabric layer with the right side of the bag facing up. Pin the flush edge of the layer down the length of the side seam. Note: Excess fabric will be present on the left side of the bag and this is fine. Step 2: Sew the top seam over the same seam stitched in Step 2 of the Create the Outside Cover section. You’re in the last stretch! Step 1: From the open end of the care cushion, with both hands, reach up to the top end and grab the corners and turn the care cushion onto itself. Once turned completely, bring the corners to a point. Step 2: Shake the care cushion vertically and horizontally. The goal is to shake the layer down from top to bottom and from the sewn seam side to the unattached side. This way the insulation layer coverage is across the entire care cushion and it lays smooth without ripples. 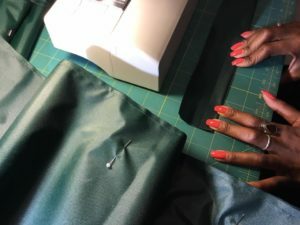 Step 3: Begin with the top seam (where the straps are exposed) and roll the seams up even with each other and pin every three to four inches about 1.75 inches from the edge. Step 1: Beginning with back stitching, top stitch all the way across the top of the care cushion using the throat plate as a guide for the stitch line – approximately 1.75 inches from the edge – back stitch the end. Step 2: Using the same method described for top stitching the top of the care cushion, pin the side seams and stop about 4 inches from the end (as described earlier for the inside seam). Step 3: Beginning with back stitching, top stitch the side seams of the care cushion using the throat plate as a guide for the stitch line – approximately 1.75 inches from the edge – back stitch the end. Step 4: Lay the care cushion out and cut evenly across the bottom – all three layers. Step 5: Fold the wool layer up about 1 inch and cut out a square from the corners to reduce the bulk in the corners. Step 6: Fold the bottom green edge up .75 inches and then fold the top green flush with the bottom folded edge and pin (with the heads of pins out to the right). 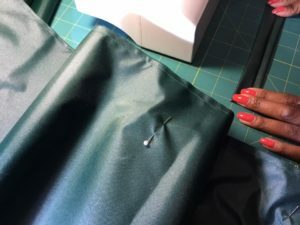 Sew a seam across the bottom end of the care cushion to close it. Step 7: Beginning with back stitching, top stitch all the way across the bottom of the care cushion using the throat plate as a guide for the stitch line – approximately 1.75 inches from the edge – back stitch the end. The Care Cushion is complete. Either share with someone in need directly or as an in-kind donation to a organization that supports the homeless in your community.